The card samples being shared today continue to feature the beautiful Garden Impressions 6″ x 6″ Designer Series Paper (DSP) and showcase additional products that will be available for order from the new Stampin’ Up! catalog on June 1, 2018. The first card below highlights the paper and a sentiment from the new Detailed With Love stamp set. The Blossom Elements were used to add a finishing touch. Yes, the Garden Impressions Designer Series Paper (DSP) is also used on the sample below and another sentiment from the Detailed with Love Stamp Set. 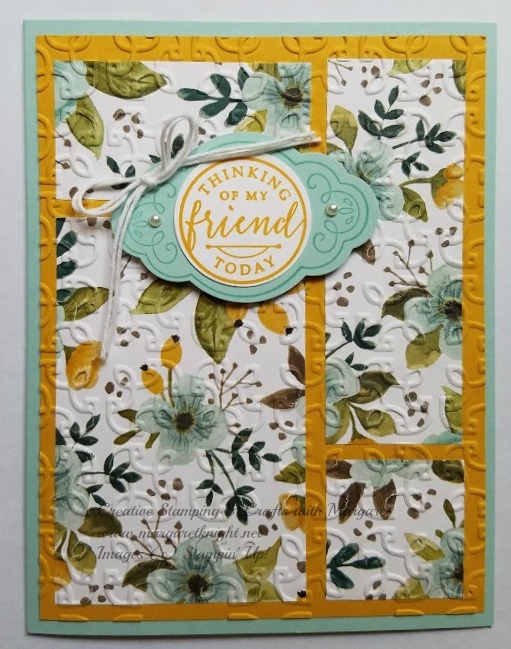 I love that the Garden Impressions DSP contains a a multitude of colors that coordinate with different Stampin’ Up! cardstock colors and the stamp set offers beautifully scripted sentiments. Additional new products featured include the Four-Petal Flower Punch and the Shaded Spruce Metallic Ribbon. In just a few short weeks, the items showcased will be available for purchase so start preparing your wish list! A great method for adding a touch of elegance to a card is to use a Textured Impressions Embossing Folder (TIEF). In the card below, the Garden Trellis TIEF was used to emboss not just the cardstock but also the Whole Lot of Lovely Designer Series Paper (DSP). When constructing the card, attach the pieces of DSP to the cardstock layer then insert into the TIEF and run through the Big Shot. Both layers are embossed at the same time and the embossing adds that little extra touch of dimension creating a subtle elegance to the card. Best of all, it’s quick and easy!